The following is the example of Procedure Text. For the definition of Procedure Text and its explanation, just click here! Salmon is an extremely versatile fish to bake, and is both delicious and highly nutritious. With a few simple steps, you can serve your family different salmon entree each night of the week. Each recipe can be whipped together in minutes. 1. Place fresh or previously frozen salmon fillets in foil. Squeeze the juice of one lemon over the fillets and sprinkle them with salt and pepper. Seal the foil tightly and bake the salmon on a baking sheet in your oven. Bake 10 minutes for each inch of thickness. Garnish with slices of lemons. 2. Prepare a marinade of light olive oil, the juice of one lemon, salt, pepper, basil and parsley in a medium glass bowl. Marinate salmon fillets in the mixture for a minimum of one hour in your refrigerator. Preheat the oven to 375 degrees and wrap salmon fillets in foil and place on a baking sheet in your oven. Bake until the salmon flakes with your fork, usually about 35 to 40 minutes. 3. Bake a salmon filet at 400 degrees for 15 to 20 minutes and cover with cover this homemade mango salsa: mix together 1 mango, diced, 1 chopped green onion, a 1/4 cup of chopped red pepper, 1 tbsp. lime juice, 1 minced garlic clove and 1/2 tsp. olive oil. Serve with a side of jasmine rice. 4. 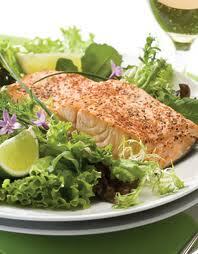 Place fresh salmon in a baking dish and cover with one packet of Italian salad dressing. Add 6 to 8 oz. of sliced mushrooms, and 2 tbsp. lemon juice and cover the dish with foil. Bake at 350 degrees for 20 minutes. Remove from oven and sprinkle with Parmesan cheese. 5. Take two salmon steaks and place them in a baking dish. Rub the tops of the steaks with 1/2 tsp. of Worcestershire sauce, a squeeze of lemon, and a Cajun spice blend (found in most supermarkets). Cover with foil and bake at 350 degrees for 20 minutes. Serve with red beans and rice on the side.